If you and your couple love the nature, this designed would be the favorite part. This picture taken from apartment is located in Tung Chung Hong Kong. 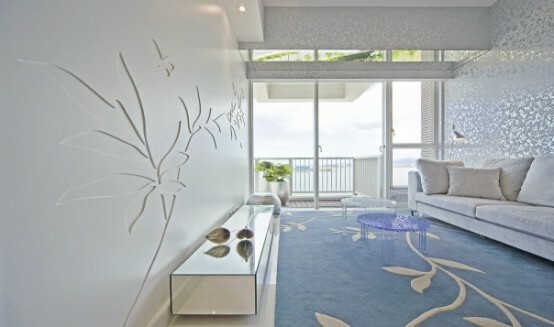 The most attractive part of this apartment is that it has been designed around a leaf and tree theme and it can be found either on the walls or floors or table. All of the house design interior ideas are inspirited from bamboo and other leaves. Every room has some theme of tree and leaves in some form. A floor to ceiling glass door is the only separation between the living spaces. This glass door too has leaves and tree embedded on it. Wallpapers are slightly reflective which too produces a feeling of openness. 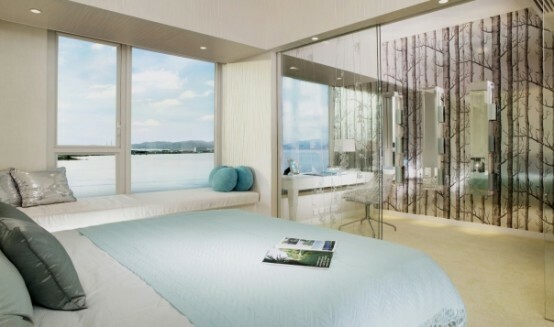 Most of the rooms are colored in natural colors with addition of silver. You can combine with white chair of Stylish Outdoor Lounge Chair DГ©cor. P Tang Studio is the main head behind creation of this theme.